I agree with fellow science guy, Bill Nye, when he said "Evolution is the fundamental idea in all of life science - in all of biology". One can view anything in biology through the lens of evolution. Thinking about how biology is shaped by the forces of evolution is a lot like thinking about how human behavior in economics can be shaped by the forces of incentives. With that in mind, I wanted to take a look at a number of topics, relevant to therapeutics and disease, wearing evolution-colored glasses. I think this approach gives an interesting perspective on both the challenges evolutionary forces create in treating certain diseases, like cancer, as well as the ways in which evolution can be harnessed for our own benefit through things like selection screens or directed evolution. Considering evolutionary forces can be critical for determining the best therapeutic approaches to take in a given disease, particularly cancer, which is essentially a disease of evolution and selection. So for my first post in this series, I would like to focus on the dynamic relationship between the immune system and cancer, two systems with great diversity and proliferative capacity - the fuel for an evolutionary arms race. In particular, I will be highlighting three recent papers that add to the growing amount of research using human immunotherapy clinical trial data to further our understanding of this dynamic battle between cancer and the immune system. One of the most appealing aspects of using the immune system to target cancer is both its ability to evolve along with the tumor, as well as its ability to potentially recognize multiple targets simultaneously in a tumor. These factors may be key for why some patients have been able to achieve very durable responses to immunotherapies. In particular, a recent paper by Verdegaal et al. has formally demonstrated this evolving arms race between cancer and the immune system, and shows the ability of the immune system to adapt in response to tumor evolution (and vice versa). The authors studied two melanoma patients treated with an adoptive T cell therapy. The patients had tumors removed and used to generate T cells reactive to that tumor, and also had those tumors sequenced to identify the potential mutations the T cells were reacting against. The T cells were not generated from TILs, as has been done by Steve Rosenberg's group, instead peripheral blood cells from the patient were stimulated repeatedly for reactivity against their own tumor-derived cell lines. The paper follows the clinical course of two patients, BO, who has an ongoing complete response after receiving the adoptive cell therapy, and patient AB, who unfortunately died of the disease. For brevity, I will just go through the example of patient AB, as this case shows both the tumor evolving to evade the T cell response, as well as the T cell response evolving to react to additional neoantigens (novel peptides presented to the immune system due to tumor-specific mutations) over time. Patient AB had a metastasis resected in 2004 (MEL04.01) that was used to produce the T cell product, which reacted against 3 neoantigens present in that tumor. The patient was treated with the T cell product, but progressed, and had further resections of metastases in 2008 and 2012. In the relapsed metastases, it was found that for one of the targeted neoantigens there was a loss of the mutation, essentially removing the target those T cells were reacting against. Another mutated gene producing one of the neoantigens was significantly reduced in its expression in the relapse, also potentially reducing the ability of T cells to react against that target. While the immune system appeared to have applied a selective pressure that led to the loss of specific targets, surprisingly, the authors found that T cells found in the tumors of the later metastases were now reacting against additional neoantigen targets. Specifically, they found that T cells were reacting against a neoantigen that, while the mutation was present in the initial tumor in 2004, was expressed at much higher levels upon relapse. This correlated with the presence of T cells reactive against that mutation in that metastasis, whereas no T cells reacting against this target were found in earlier tumors. This shows that the immune system is also dynamic, and has the ability to change its reactivity toward a tumor depending on the presence of targets it can recognize. While this may not be surprising, this is the first time that immunoediting, the loss of specific antigens in response to pressure from the immune system, has been demonstrated in human tumors, and further establishes the neoantigen-reactive T cell as a mediator of anti-tumor activity. Considering that the vast majority of mutations found in a tumor are probably not contributing significantly to its growth, and are so-called passenger mutations, it is not surprising that the tumor selects for loss of these mutations. The ability of TIL therapy to generate potential cures in a percentage of melanoma patients is most likely then due to the simultaneous targeting of multiple neoantigens by diverse T cell clones. In fact, the Rosenberg lab recently charaterized a TIL product, and found the T cells were able to react against 10 distinct neoantigens. In all, this work shows that the relationship between the tumor and the immune system is not static, with both the tumor and the immune system able to change in response to each other. This has implications for targeting cancers with immunotherapies. Specifically, that you will need to generate a response against a multitude of neoantigens to get the potential durable responses desired, whether that is through the use of broad immunomodulation with checkpoint inhibitors, or designing adoptive cell or vaccine products with reactivities against neoantigens. Next, a recent paper from Charles Swanton's group asked the question if all of these potential neoantigen targets created equal. This paper was also discussed nicely on this blog specifically focused on the concept of cancer and evolution. There is significant evidence that the neoantigen-reactive T cell is a/the critical mediator of checkpoint antibody efficacy, and the number of predicted neoantigens correlates with efficacy. However, the authors of this paper ask the question whether its just the total number of neoantigens that matters, or if also the clonality of those neoantigens matter. This is something I have wondered about as well. Specifically, does it matter if the neoantigens are present in almost every cell in the tumor (clonal), or only present in a subfraction of the tumor cells (subclonal). This is illustrated in a theoretical tumor below: shown is a clonal "trunk" mutation A, and subclonal "branch" mutations B-F. The authors measured the clonality of the total of a tumor's predicted neoantigens and looked to see if that influenced survival and response to checkpoint blockade. Starting in lung cancer, they found that patients with lung adenocarcinomas with high neoantigen load had longer overall survival, not taking into account treatment, and that this stratification improved further when taking into account the clonality of the the neoantigens. Specifically, the subset of patients with high neoantigen load and low neoantigen heterogeneity had the best survival. Interestingly, they found that lung squamous cell carcinomas did not have this same association, and the authors present some evidence that these tumors might have reduced processing/presentation of antigens compared to adenocarcinomas. The authors were able to identify neoantigen-reactive T cells in patients with tumors with both high and low intratumoral heterogeneity, but they could only find neoantigen-reactive T cells to clonal neoantigens and not subclonal neoantigens. This suggests that subclonal neoantigens may not induce a robust T cell response. Unsurprisingly, neoantigen-reactive T cells tended to express more inhibitory markers, such as PD-1 and LAG-3, which has also been seen by the Rosenberg group. Next, they went on to see if the intratumoral heterogeneity of neoantigens, in addition to the total number of neoantigens, could effect the response to checkpoint blockade. Using sequencing data from recent PD-1 studies in melanoma, they stratified patients who had a durable clinical response to PD-1 blockade versus those who did not. 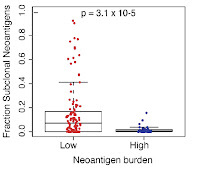 They found that for a given threshold of high neoantigen burden and low intratumoral heterogeneity, 12 out of 13 patients had durable clinical benefit, compared to only 2 of 18 patients who had either high intratumoral heterogeneity or low neoantigen burden (shown below). Further, they found that applying a threshold for the amount of intratumoral heterogeneity of neoantigens helped to better predict the outcomes of patients treated with PD-1 blockade in NSCLC (Rizvi cohort) or CTLA-4 blockade in Melanoma (Snyder cohort) than neoantigen burden alone. These data raise the question - does inducing non-clonal neoantigens actually weaken the response a patient has to checkpoint blockade? This could have implications for treating patients who are heavily pretreated with radiation/chemotherapy which may have induced non-clonal neoantigens. The authors specifically looked at data from heavily pretreated melanoma patients, and found that treatment led to high levels of non-clonal neoantigens. In this population, the predictive power of neoantigens alone to predict response is lost, but if you combine this with intratumoral heterogeneity of neoantigens, this now almost able to reach statistical significance to predict response. The authors stated there were too few patients to sufficiently power this analysis, so this is still speculation. 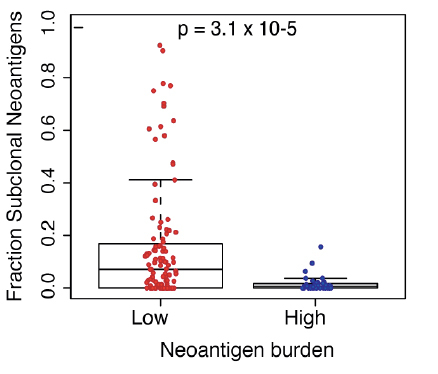 I would have expected a higher neoantigen burden would be indicative of greater intratumoral heterogeneity, not less. This also makes me curious what this analysis would look like for for mismatch-repair deficient cancers, since their tumors might have higher ongoing genomic instability, instead of just accumulated mutations caused by previous carcinogens, like UV or smoking. Tumors with this deficiency have been found to be sensitive to checkpoint blockade, presumably due to their high number of mutations increasing the "tumor foreignness" for the immune system to recognize. Specifically, it would be interesting to see if mismatch-repair deficient tumors have high intratumoral heterogeneity, and if patients can have positive outcomes with checkpoint blockade despite their high levels of heterogeneity. While mouse models have drawbacks, especially in the study of tumor immunology, it will be interesting to see if any groups try to experimentally test whether increasing or decreasing the heterogeneity of tumor antigens effects the immune response to them. In addition, this work suggests that the strategy of mutagenizing a tumor to increase the number of neoantigens may not lead to a more productive immune response, and could potentially hamper it. The etiology of these mutations would be different from the mutations initially present in a tumor, which accumulated under the stringent selective pressures of initial tumor development. A way to recreate this accumulation of mutations but with higher clonality might be to first mutagenize the tumor (with chemo/radiation or disruption of DNA repair) and then try to create a new evolutionary bottleneck with a targeted therapy with a high response rate that could apply a selective pressure to increase the clonality of the tumor. You might need a really effective second therapy to reduce the heterogeneity sufficiently, though. It would be interesting to see how different therapies effect the clonality of a tumor, and Swanton's group is performing a longitudinal study, called TRACERx, looking at how clonality changes during the course of treatment, which may shed light on therapies that increase and decrease tumor heterogeneity. While like other studies retrospectively looking for biomarkers of response, this study is correlational and further validation is needed, intratumoral heterogeneity is now on the map, and should be considered as a potentially predictive biomarker of response to checkpoint blockade, which are nicely summarized in this review. Better biomarkers may allow doctors to better stratify patients, and determine which are most likely to benefit from these therapies. This study also emphasizes the importance of targeting the clonal "trunk" neoantigens for cell or vaccine based therapies directly targeting neoantigens. It also suggests the potential importance of developing strategies to reduce intratumoral heterogeneity or targeting the causes of heterogeneity. While the ability of T cell populations to recognize multiple neoantigens in a tumor may reduce the risk of relapse due to loss of single neoantigens, there is the potential for escape mutations that globally make the tumor less sensitive to T cell recognition or attack. These mutations could potentially be the most pernicious, as they could essentially make the tumor unresponsive to any therapy dependent on T cell recognition of the tumor. Unfortunately, evidence of these types of mutations has been observed in a recent paper looking for the causes of relapse after an initial response to checkpoint blockade. The authors examined the cases of 4 patients with melanoma who had this clinical course of a relapse after a relatively prolonged period of response to therapy. By sequencing sequential biopsies of tumors pre-therapy and post-relapse, the authors were able to look for new mutations present at relapse that could explain their loss of responsiveness. The vast majority of mutations were conserved between the tumors at both time points, but they found homozygous loss-of-function mutations in JAK1 in one patient and JAK2 in a second patient. 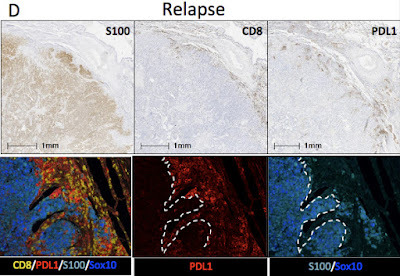 Looking at the biopsies of from these tumors at relapse, they found that both of these patients lost PD-L1 expression at the interface of the tumor and stromal cells, despite the continued presence of CD8+ T cells at this interface, and presence of PD-L1 expression in adjacent stromal cells (shown below). The authors wondered if these JAK1/2 mutations could be causing a loss of responsiveness in the tumor to interferon-gamma, which normally induces PD-L1 expression. 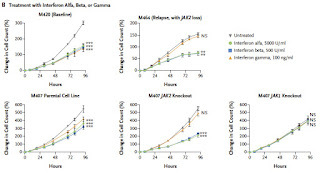 They found that T cells could still recognize tumor cells, however, tumor cells from both patients lost responsiveness to the growth-inhibitory effects of IFN-gamma, and to all interferons for the JAK1 mutation (below). They subsequently showed these mutations were sufficient to cause this loss of responsiveness. They went on to look for relapse-specific mutations in a 3rd patient, and found B2M mutations, which have previously been shown to cause loss of MHC class I surface expression, and inability of tumor cells to be recognized by T cells. Immunohistochemistry from this patient showed this loss of surface localization for MHC class I.
Interestingly, B2M mutations have been observed in about 30% of colorectal cancers with microsatellite instability (mismatch-repair deficient). Surprisingly, these mutations were not a negative prognostic marker, and if anything, trended toward being a positive prognostic biomarker. This raises the question if there are negative consequences for the tumor for mutating B2M. Another question this raises is in mismatch-repair deficient CRC, which as a class are quite responsive to checkpoint blockade, if patients that already have baseline B2M mutations are more resistant to checkpoint blockade. This could be used as a predictive biomarker if found to be the case. The results from this paper also may have implications for combining PD-1 + JAK inhibitors such as in this trial. 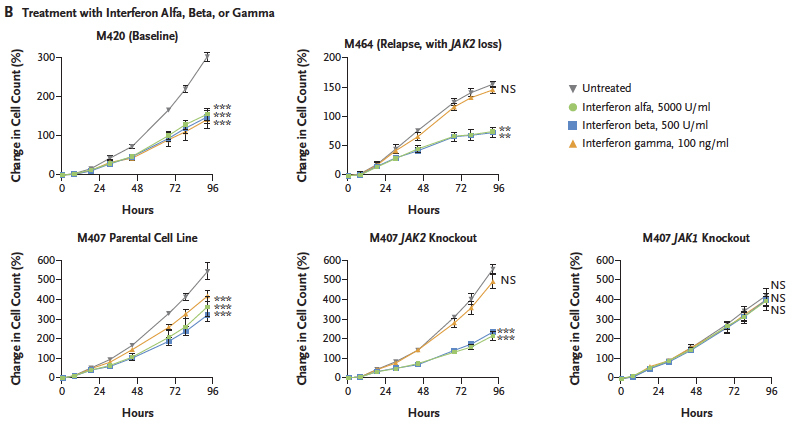 The results in this paper would suggest sustained inhibition of JAK signaling could reduce tumor responsiveness to T cells. In summary, this paper demonstrates how the tumor can develop adaptive resistance to checkpoint blockade by either reducing the ability of T cells to react to the tumor or the tumor to react to T cells. Considering the ability of cancer to evolve resistance to basically any therapy we throw at it, it is almost surprising that these mutations are not essentially inevitable, and that it is possible to get these extremely durable responses with current therapies.This paper, however, highlights the need for future strategies to deal with these types of mutations. For B2M mutations perhaps by engaging other elements of the immune system, such as NK cells, that might be able to recognize this "missing self", and react to the loss of MHC surface expression. And for JAK1/2 mutations, perhaps using strategies that are not reliant on interferon for efficacy. Additionally, it is possible these B2M or JAK1/2 mutations produce compensatory vulnerabilities that can be exploited therapeutically. It will be worthwhile to further study the mechanisms of adaptive resistance to checkpoint blockade to develop the best strategies for dealing with it. These three papers highlight the ability for both the immune system to adapt to the evolving tumor, as well as the ability for tumor evolution to produce problems for the immune system. It will be critical to understand, for each individual patient, what is the status of this tumor-immune system interaction, and how the tumor is avoiding immune surveillance. While we may not currently have therapeutics to intervene in patients for all the different mechanisms of immune evasion, further understanding the mechanisms critical for tumor survival will help identify new targets and rationally combine therapeutics. 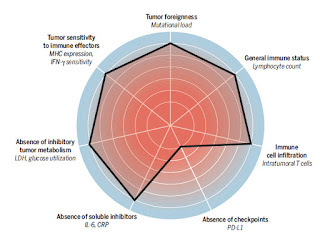 This thinking is summarized nicely in a review called "The Cancer Immunogram", which attempts to think about treating cancer in terms of defining the different aspects of tumor-immune interactions critical for an immune response in a patient's tumor. 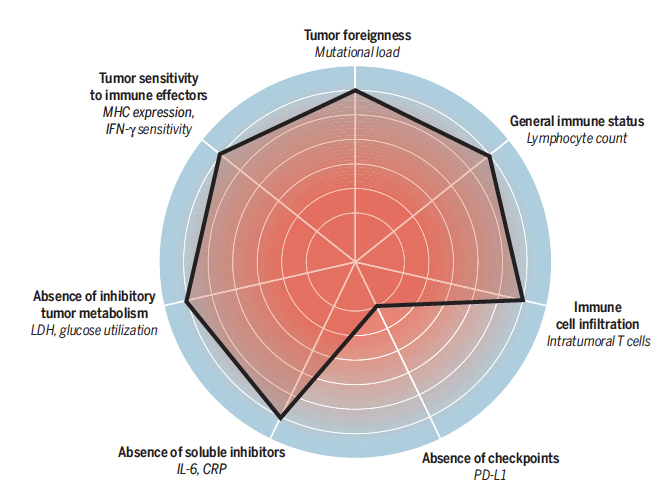 The authors describe seven categories critical for effective recognition of cancer by the immune system, they are (shown below): tumor foreignness, general immune status, immune cell infiltration, absence of checkpoints, absence of soluble inhibitors, absence of inhibitory tumor metabolism, and tumor sensitivity to immune effectors. - It will probably be necessary to target multiple mutations simultaneously to reduce the likelihood of immunoediting of antigens and tumor escape. - It is important to understand the intratumoral heterogeneity of a potential target neoantigen, and, if possible, target clonal mutations. - Intratumoral heterogeneity may become a useful predictive biomarker for response to checkpoint therapies, and become part of how we define tumor foreignness in the cancer immunogram. - Intratumoral heterogeneity is a problem, and it will be important to develop strategies that either reduce heterogeneity or target the mechanisms that lead to heterogeneity directly. - Mutagenizing a tumor, by itself, may not generate productive tumor-foreignness and immune recognition. Perhaps if we can provide a new evolutionary bottleneck for the tumor, we can increase the clonality of these induced mutations. - Unfortunately, there are mutations that make tumors less sensitive to T cell attack generally, and it will be important to develop strategies that target tumors that evolve this response. "It will be critical to understand, for each individual patient, what is the status of this tumor-immune system interaction, and how is the tumor avoiding immune surveillance. "